Last edited by avrlabel on Thu Dec 04, 2014 4:33 pm, edited 1 time in total. Last edited by avrlabel on Thu Dec 04, 2014 4:34 pm, edited 1 time in total. Last edited by avrlabel on Wed Aug 10, 2011 8:28 am, edited 1 time in total. Up with few tapes more.. Some stiff gone, and Black Majesty not anymore reserved! 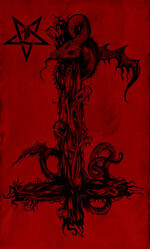 Morbid Angel-Abominations of Desolation pro tape boot ltd. 99. Payment cash in letter...Located in Europe. Embrace of Thorns-The inevatible twilight.. (!) I'm willing to exchange stuff for certain books from amazon or abebooks. Just ask! Last edited by avrlabel on Sun Jul 13, 2014 6:08 am, edited 7 times in total.